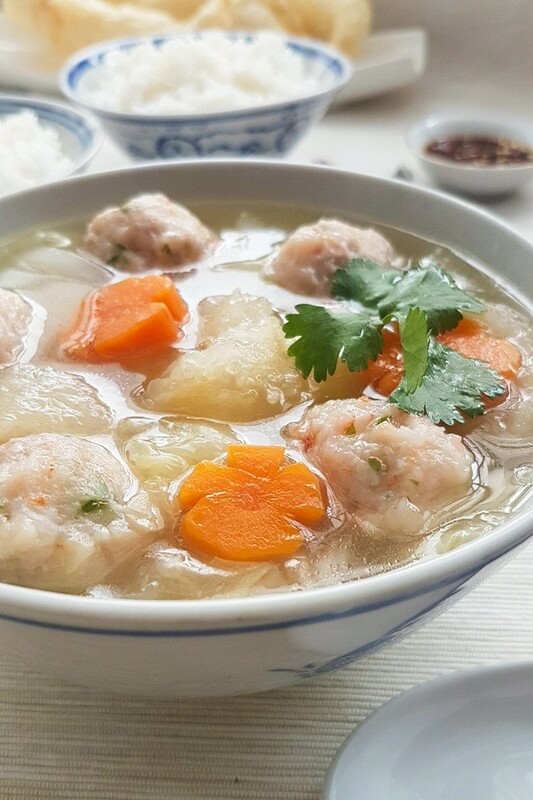 For the Chinese, fish maw soup and dishes are popular during special occasions and festivities such as the Chinese New Year (CNY) and weddings. 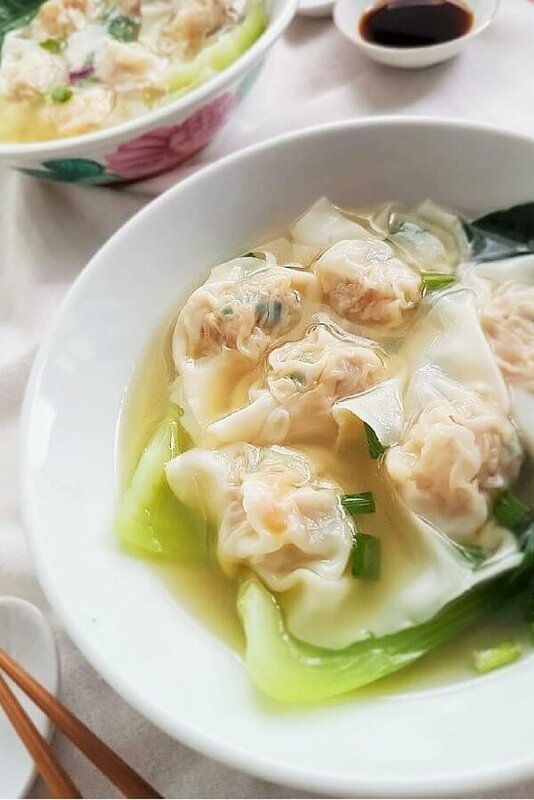 Usually cooked in soups and sometimes steamed and braised, I especially enjoy its gelatinous texture after cooking. Fish maw is the commercial term of dried swim bladders (or gas bladder) of large fish. It is an organ in certain fish which controls their buoyancy. Along with abalone, sea cucumber and sharks’ fin, fish maw is considered one of the four delicacies from the sea in Chinese cuisine. Rejoice if you’re a fan of fish maw as it is said that fish maw is high in collagen and good for the skin! A typical Chinese, I do love to eat food with high collagen content such as pig trotters, birds’ nest, chicken feet and fish maw – the stuff that some foreigners find exotic and scary even. It is simply delicious if cooked right. From what I read, fish maw are graded by the gender of the fish. Male fish bladders are better than female ones as it is thicker and can withstand longer cooking times. But if you ask me, I really do not care mind whether it is a male or female as long as it tastes good. Prices can differ astronomically for certain varieties of fish maw. It is not necessary to get the expensive types for this fish maw soup unless you want to. In fact, you can even use the much cheaper fried fish maw (called ‘yue piu‘ in Cantonese) which looks quite similar to dried fish maw. Fish maw has to be soaked water before cooking as it is very greasy. Then rinse a few times and gently squeeze out excess water before slicing them. I added yuan xiao bai (圆小白) for this fish maw soup. It tastes sweeter than napa cabbage (wong bok) which is what I usually would use. Apparently, they’re only available during the CNY period or so I was told. In case you’re wondering, I bought it from the Giant supermarket but I suppose you could find it at the wet market too. Using prawns to make meatballs can be expensive so get smaller prawns as they’re going to be minced anyway. Don’t over blend or over mince the prawns so that they’ll have a better mouthfeel. The minced pork acts as a filler and helps to bind all the ingredients together. After blending, the paste has to be refrigerated to allow it to firm up and the seasonings to impart their flavor. 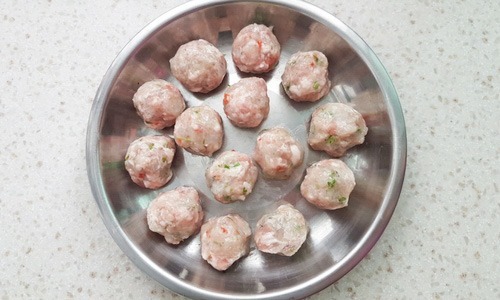 This recipe makes 15 large prawn balls (one is not in the picture) or 16 smaller ones. Don’t worry if the prawn balls are not perfectly shaped. The taste is more important. Tip: Wear disposable gloves if you don’t want your hands to get dirty as the paste is very sticky. To make the prawn balls springy, I prepped and marinated them overnight (see recipe for full details). This may seem like a lot of work, but it is worth the effort. I tested this recipe with and without using this method and my family agreed that the version with the prepared prawns had a better mouthfeel. Fish maw does not have much taste of its own (rather bland in fact) and thus, it absorbs the flavors of the liquid it is cooked in very well. To make any fish maw soup, all you need is a good broth and you’re set. Depending on the ingredients you use, it can be simple and homely or lavish. 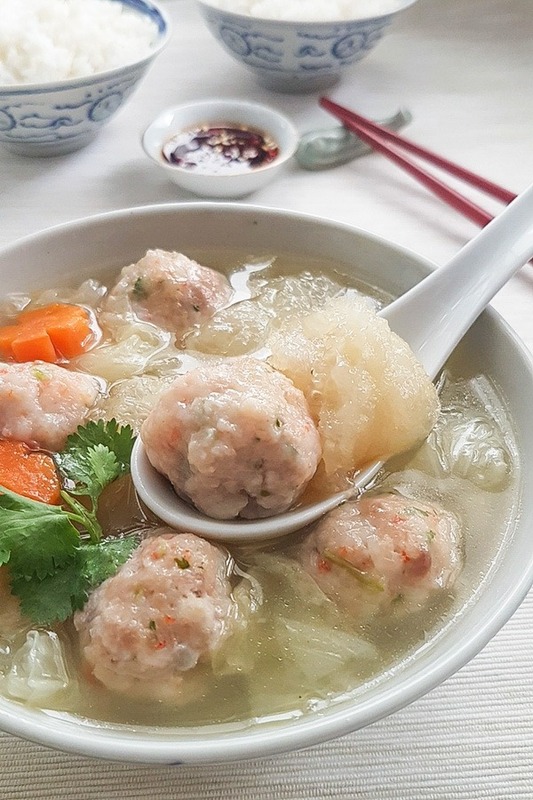 Delicious fish maw soup with springy prawn meat balls. A delicious treat for the whole family. Prep prawns to make them crunchy. Peel and remove veins from prawns. Submerge them in a bowl of cold water. Add 1 tbsp of baking soda and gently massage the prawns. Set aside for 30 minutes. Rinse prawns thoroughly before patting dry. Add egg white and tapioca starch to the shrimp and gently massage. Marinate for about 4 hours or overnight for best results. The next day, soak fish maw in water in a large bowl until it softens. If the fish maw is still very greasy, change the water repeatedly. Remove, rinse and gently squeeze out excess water. Cut into bite-sized pieces. Mince or blend prawns but not too finely. Combine the prawn paste with the rest of the ingredients for the prawn balls. Refrigerate the paste for about 30 minutes. Wet your hands and scoop 1 tbsp of the prawn paste (See note 1). Roll into a ball. Repeat the process until the paste is finished. Bring stock to a boil. Add carrot and fish maw. Simmer for 5 minutes or until the fish maw just softens. Add napa cabbage and cook for 3 minutes. Add prawn meatballs and simmer for about 4 to 5 minutes. If you're using homemade chicken stock, season with salt to taste. Garnish with coriander leaves and serve immediately. 2. 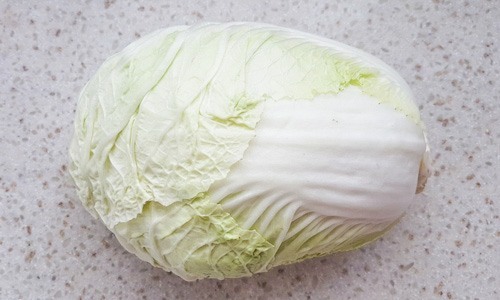 Use yuan xiao bai (圆小白) if available to replace napa cabbage. 3. Cook the prawn balls by simmering. Do not boil them.